We met many years ago at the age of 11 when we attended the Lea Valley Music School on Saturday mornings, and have remained firm friends ever since. 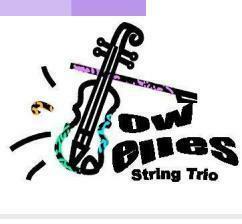 As well as forming Bow-Belles, we also play together in local orchestras including the Hertfordshire Symphony Orchestra and the Ware Maltings Symphonia. We are all married and can understand how stressful weddings can be! We hope our friendly, helpful approach and familiarity with the course of events at weddings will help to make your day run smoothly. We also know how hard it can be to choose suitable music for your special day, don't worry, we have a vast repertoire and our in-house music arranger can specially arrange a piece for you if its not already on our repertoire list. Emma has played the violin since she was seven and studied music at the London College of Music, the Guildhall School of Music and Trinity School of Music. She also plays the piano and has sung around the country and abroad with various bands including Street life and One Big Emotion and played with the Salisbury String Quartet. Since having two daughters, Emma now teaches the violin and piano both privately, at local schools and Hertfordshire music centre where she teaches the choir and junior musicianship. Suzanne started playing the violin at the age of seven, and has been playing ever since! She graduated from Middlesex University with a degree in music. Suzanne now plays first violin with the Hertfordshire Symphony Orchestra and Ware Maltings Orchestra and teaches violin and recorder for the Hertfordshire Music Service. Emma started playing the cello when she was 12 and smaller than the instrument! Having achieved Grade 8 she has played in many orchestras including her University Orchestra.